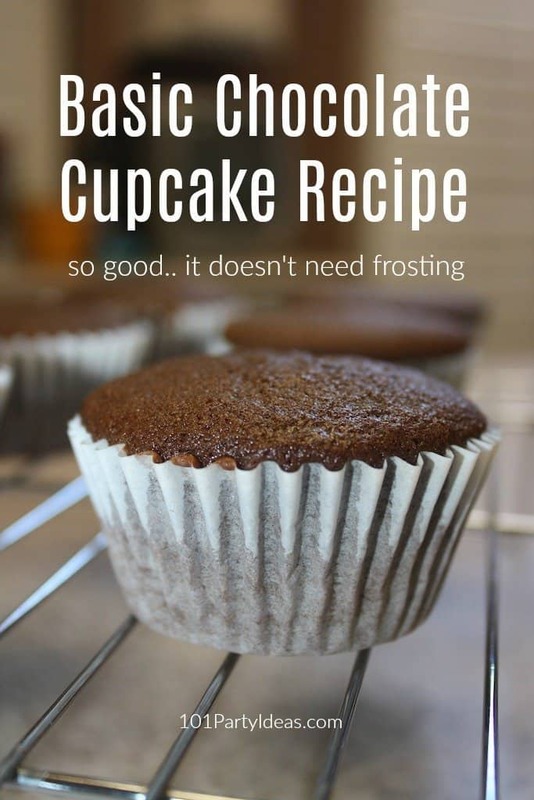 Here’s a Basic Chocolate Cupcake Recipe that is so good you won’t need frosting to eat it. Usually, kids will only want to eat the cupcake frosting, but this came out beautifully puffed from the oven and was so delicious – we each immediately ate 3 cupcakes and didn’t bother making the frosting. It’s great eaten immediately after it’s no longer hot but just warm with its crisp top and airy interior. If you intend to add frosting, make sure to wait until it has cooled. Line your muffin pan with cupcake liners. Sift the flour, baking powder, baking soda, cocoa and salt together. Set aside. In a mixer, cream together the butter and sugar until well incorporated. Add the flour mixture alternately with the milk. Beat well until smooth. Fill the muffin cups 2/3 full. Yields 21 cupcakes. Bake for 17 minutes in the preheated oven or until a toothpick inserted into the cake comes out clean. Let cool.